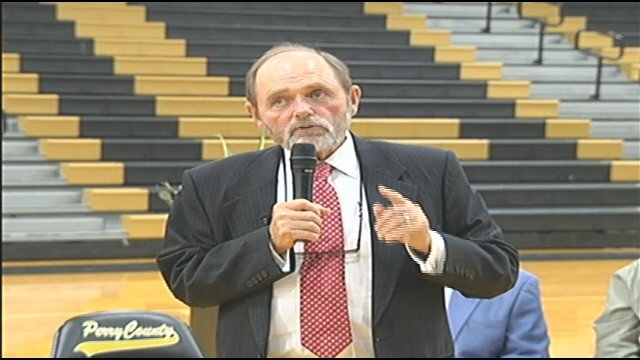 Jim Ayers addresses Perry County High audience. 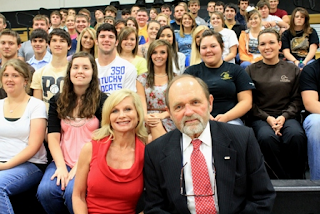 Jim and Janet Ayers of the Ayers Foundation made an exciting announcement today to students and leaders at Perry County High School. Ayers Foundation Scholarships will be made available beginning with this years graduating class and continue with future classes. The scholarships are four-year awards that can be used toward tuition at Tennessee Universities or Trade Schools of the student's choice. The announcement was met with a big round of applause! Jim Ayers is originally from the area, and has a passion to help students from the county in pursuing their education. The Ayers have a home in the area, and operate a branch of their First Bank in nearby Linden. Ayers never forgets where he comes from and enjoys being able to give back to his communities. Janet and Jim Ayers with Perry County High School Seniors.